For the past month or so I have been working with CELCIS. The Centre for Excellence for Looked-after Children in Scotland is a bit of a mouthful but its work is simple: trying to improve the way all sorts of agencies support children who have come into the care of local authorities. Not my bag, really, I kind of thought at first, but it’s been a fascinating experience talking to social workers, children’s panel members, lawyers … everyone involved in the delicate and no doubt often stressful process of helping to settle looked-after children. 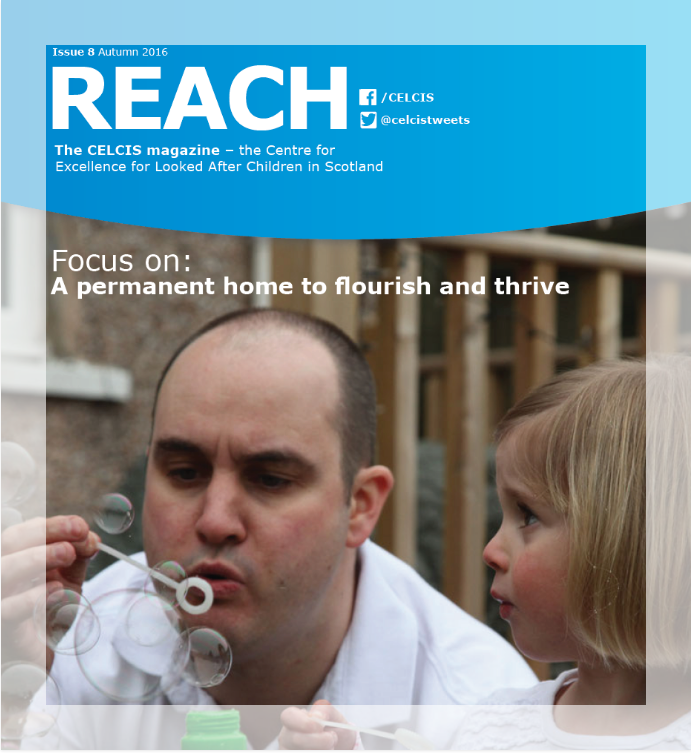 I’ve been helping to create a new multi-media edition of CELCIS’s in house magazine, Reach, based around the theme of permanence – the difficult job of settling looked-after children in places where they can be assured they can stay until they grow up – and beyond if it’s needed. We’ve been talking a lot about PACE, CELCIS’s drive to help local authorities speed up the route to permanence. But the material is not a straighforward love-in, with a kinship carer and a parents’ advocate making strong points about their needs within a system designed to put children first that can sometimes I’m sure not work properly, and seem a Kafkaesque place. I’ve been marking up film for editing, transforming interviews into blogs and articles, and – my favourite bit – creating podcasts of all sorts of people talking freely about their work. It’s all here: CELCIS comms lead Lesley Sneddon has woven the material into a modern multi-media magazine, and it looks great. It’s aimed at people with some knowledge of the system so you might not be familiar with all the terminology, but if the topic or the way it’s done is of interest, take a look:It looks to me a bit like the future for a lot of publications. Next: Fake news from 1764?